Iran has sent a letter to the French Embassy in Tehran protesting the screening of a movie about the country at the Cannes Film Festival. 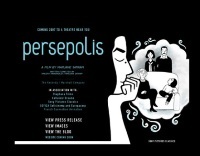 The movie under dispute is "Persepolis," an animated adaptation of Marjane Satrapi's novel about growing up in Iran after the Islamic revolution. The film is competing for the festival's top prize, the Palme d'Or, and has its official screening on Wednesday. The protest letter was sent by the Iran Farabi Foundation, a government affiliated body in charge of festivals in Iran, according to ISNA, which provided the text of the letter. "This year the Cannes Film Festival, in an unconventional and unsuitable act, has chosen a movie about Iran that has presented an unrealistic face of the achievements and results of the glorious Islamic Revolution in some of its parts," the letter read. The letter said the inclusion of the film would damage the reputation of the festival. ISNA did not indicate when the letter was sent, but did report that Iranian authorities had not yet received a response. Attempts to contact officials at the French Embassy in Tehran went unanswered.